Chassis no. 055352 - Engine no. This car has a Gilco modified chassis. It ran Mille Miglia and Targa Florio in 1952 and Mille Miglia and Coppa d’Oro delle Dolomiti in 1953, among others races in the 50s. The strong competition, especially with Stanguellini and O.S.C.A. 's cars, became increasingly fierce and convinced the Florentine builder to abandon his project to developed the Ermini-Fiat engine in favour of designing, with the help of engineer Alberto Massimino, a new four-cylinder engine. “114” stood for the engine displacement and the number of cylinders, which was common practice at the time. To increase the power of the engine was adopted a solution which provides an aluminium block with five main bearings with a new project of twin overhead cam. The new engine, designed and built entirely by Ermini, was one of the few racing engines that did not come from other standard propelling forces, thereby giving further prestige to the Florentine car constructor. Thus, car registrations began to have the word “Ermini”, without the suffix “Fiat”, while maintaining the official set of numbers of the chassis. The Florentine car constructor could, therefore, use its own progressive numbering system for its engines. complied with the new regulations of the International Sporting Code which required the fenders to be attached directly to the body – that is why it took the name of Ermini Sport Internazionale. That same year, with the new engine, Motto of Torino set up two more cars, this time with covered wheels as required by the new rules, one of them was for Aldo Terigi and the other for Ugo Puma. These cars had a Gilco 203 chassis, modified at the rear for Ermini, and lighter “cantilevered” leaf springs. Chassis 055352 is the Aldo Terigi car that raced the Mille Miglia in 1952 with Pugi but did not finish the race. Terigi won instead of the class in the Targa Florio and he came 2nd in class at the Coppa d’Oro delle Dolomiti. In 1953 Aldo Terigi won the class during the Coppa della Consuma and at the Coppa Balestrero. 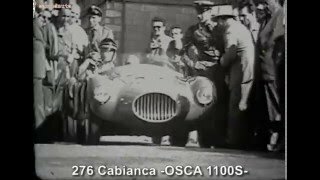 It also ran the Mille Miglia in 1953 with Bernardeschi without success. This car ran several races, and in 1956 it was bought by the Scuderia Centro Sud.